The first Arab coins of North Africa and Spain divide into three series that were issued in the two decades from the capture of Carthage until 715. One of these comprises coins with Byzantine imperial images and Muslim religious inscriptions in Latin, but without any date or mint name. A second series includes coins without images with Latin inscriptions. This group has the mint name AFRICA for Ifrîqiya, the Roman and Arab province centered upon modern Tunisia, and it has dates equivalent to 703 to 715 of our era. The third series mostly has a star with seven or eight rays on the side we call the obverse, with inscriptions that include the province name SPANIA for Spain, or rather Iberia in modem terminology. The Spanish coins have dates equivalent to 712 to 714. Because all these coins were issued by the Arabs with Latin inscriptions, they are called Arab-Latin coins as a sort of numismatic shorthand 1. Subsequently, an issue was produced in Spain and in Africa from 716 to 718 with Arabic and Latin inscriptions together on each coin. After 718-19 (100 Hijri), all these were replaced by purely Arabic coins much like those of the rest of the caliphate. In the year 101 (719-20), there are Arabic dinars of Ifriqîya with a thick small flan like the previous Roman and Arab-Latin issues, and others with a broad thin flan like the dinars of Damascus. indicating that in that year, finally, workmen were sent to Ifrîqiya from the capital either to take over the mint or to show the local minters how to manufacture blanks2. Although the Arabs already ruled much of the country long before Carthage was taken in about 695, there is no reason to believe that there was any coinage under their authority before they took over the mint of the capital. The Carthage mint had functioned for the Roman provincial government right up to the conquest of the city, as shown by a solidus 3 that can be assigned to 695 4. At some point after the conquest, but before 702, the Carthage mint began a series of coins with representations of two Roman imperial figures 5, and a modified version of the cross potent on steps that was the standard seventh-century reverse symbol for gold, but with highly abbreviated Latin inscriptions expressing simple monotheistic religious doctrines. The Arab coins with images evidently were a continuation of the previous Roman money of the province in some respects, but the prototype for the images was an issue of Heraclius that was more than seventy years old, and the inscriptions were completely original. Under the Arabs, there were three denominations in gold: the solidus, its half, and its third. The weight standard of the solidus, 4.29 grams, was the same as the standard of the Roman Carthaginian coins6. This was lower than the weight of the Roman solidus of Constantinople, which was about 4.50 gains, and slightly higher than the gold dinar standard of 4.25 grams introduced in Damascus in 697. All eighth-century Arab gold coins of North Africa and Spain had this local weight standard 7. The gold issues of Carthage under the Romans and the Arabs were also identical in physical fabric, being smaller in diameter and about twice as thick as the gold coins of Constantinople or Damascus. The continuity of this distinctive fabric indicates that at least some of the men who made the Roman coins stayed on to make coins for the Arabs. The first Arab Spanish coins also have the same fabric and weight standard as the African coins, indicating that monsters from Africa were taken to Spain (there is no trace of Visigothic continuity in the Arab coinage of Spain). There are also Arab coppers probably from Carthage. These do not continue the previous Roman copper coinage in any way; their design, inscriptions, and workmanship are similar to the Arab gold coinage. The Latin inscriptions on the coins with images, as well as on the coins without images that began later, are exceedingly difficult to decypher. 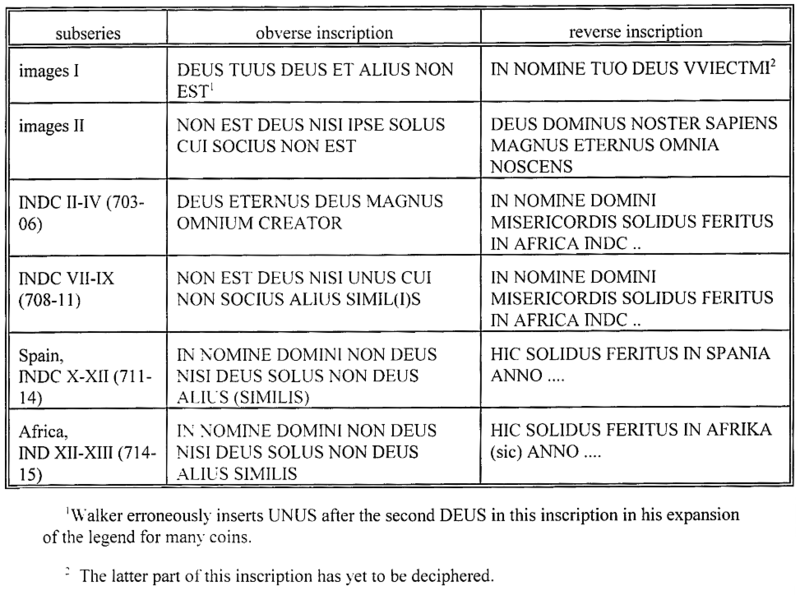 The earliest for example has DVSTVSDVSETAVSNONE, which can be expanded to DeUS TuUS DeUS ET AliUS NON Est: “God is your God and there is no other”. The alphabet is a mixture of Latin and Greek letters, the latter being sometimes lower case, sometimes upper. The same words may be abbreviated in different ways. There are frequent mistakes in the inscriptions, such as omitted letters. duplicated letters (and words), inverted letters, and others. Since the (end page 12) inscriptions were written around the circumference of the dies used to stamp the coins, and the coin blanks were smaller than the inscribed surface of the dies, it usually happens that only part of the inscription was impressed on any particular coin. These difficulties eliminate the argument that Latin was used as a means of communication with the provincial populations8. which was the central inscription of the contemporary Arab Islamic coins of Damascus. The alternative chronological sequence, beginning with a translation of the central Muslim statement of faith followed by a simpler neutral monotheistic statement, is inconceivable. The other series, without images, also has two principle inscription types. The first coins without images, dates years II, III, and IV (703-6), have an obverse inscription which is merely a few epithets for God: “God is eternal, God is great, Creator of all”. A fornula translating the shahâda does not appear until the next sub-series, beginning in indiction VII (708-9); the inscription “There is no god except the One, who has no other like associate” on these latter is quite close though not identical to that on the second issue with images. In this case we see, confirmed by these dates, the same progression from simple monotheistic slogans to a translation of the fundamental Muslim credo, the shahâda, that was proposed for the image coins. Heretofore it has been assumed that the coins with images and those without came from the same mint and form a single chronological sequence; first the Arabs issued coins imitating Roman coins, including the images, but then they Islamicized the coinage somewhat by abolishing the images. This assumption is far too hasty, if we consider the inscriptions, because some of the coins with images have a translation of the shahâda, while the earliest coins without images have simple monotheistic slogans. As previously proposed. it is inconceivable that the Arabs regressed from a translation of the Muslim shahâdda to nondenominational slogans. Since both series. with and without images. have the same progression from simple slogans to the shahâda, it makes more sense to regard them as parallel contemporary issues from two different mints. There are obvious candidates for the identification of these mints. The coins with images were probably issued by Carthage and those without images by the Arab provincial capital, al-Qayrawan. The coins with images doubtless began earlier, but they did not cease to be issued when the coins without images started in 703-4. they probably were still being issued in 708, when the dated coins without images begin to be inscribed with the translated shahâdda; probably the coins with images began to be inscribed with their version of the shahâdda at the same time. There is no absolute date for the termination of the image series, but they are very unlikely to have continued after the introduction of coins with Arabic and Latin inscriptions in 716. That series includes one variety for Spain and only one for Africa. One of the two African mints was therefore closed by that time; it was presumably Carthage. Note: This table is in the longer manuscript from which this article was drawn, but was not in the published version of the present article. The conclusion to be drawn from this sequence of dates and mints, as well as from the identity of fabric and style between the African and Spanish coins, is that the mint of al-Qayrawan went with Musa to Spain in 712 and returned with him in 714. Mobile mints are not at all unusual in history: the Roman emperors had them, as did the Shahs of Iran and the Mughal emperors. A camel could carry any of the equipment of a mint except the smelting furnaces, which are not difficult to construct. If the first Arab mint of Spain was brought there from Africa, we can understand why there is no trace of Visigothic influence on the Islamic coinage of the province. It is interesting to observe the difficulty that these provincial early Muslims had in composing an adequate Latin version of the Muslim shahâda as found on the coins of Damascus. It is not the translation that seems to have been the problem, but rather the formulation of the original: what was the shahâda? The uncertainty of the Maghribi Muslims about this accords with other evidence suggesting that the shahâda was first put together, or first became important, in the reign of ‘Abd al-Malik. It is not in the Qur’an, although all its phrases are. Numismatically, it appears first on the gold and silver coinage of Syria which is generally acknowledged as an innovation of ‘Abd al-Malik’s reign, despite doubts about the exact date; and it does not appear on the coinage of Iran until the time of al-Hajjaj, in 76 Hijra. No monumental inscriptions are known with the shahâda before ‘Abd al-Malik. It is also worth noting that the Prophet Muhammad is not mentioned on the purely Latin coinage. The early Arab coinage of Africa was an interesting hybrid of the earlier Roman coinage of Carthage and the new contemporary Islamic coinage of Damascus. Arabs and “Romans” in Ifriqiya worked out, on the Spot, a new coinage for the new regime by combining vague knowledge about what was happening in Damascus with pre-existing local practices. Like other parts of the caliphate, the Maghrib had its own numismatic history shaped by local circumstances. 1 The starting reference for this series is John Walker, A catalogue of the Muhammedan Coins in the British Museum, II: A Catalogue of the Arab-Byzantine and Post-Reform Umaiyad Coins (London, I956), pp. xxxix-li and 54-80. The present paper is abridged from “The Earliest Arab Coinage of the Maghrib”, forthcoming. 2 Stephen Album (Santa Rosa, CA) Price List l l4 (February 1995), p.1 no. 8. 3 Like most pre-modem coins, the late Roman gold coins are not labeled with their name or value. Latin speakers would have called them solidi or denarii aurei, or perhaps by other less formal names that have not come down to us. Arabs called them dinars, a word derived from denarius. For convenience, we call the coins with Latin inscriptions solidi and those with Arabic inscriptions dinars. The truth of all this is demonstrated by the coins that have both Arabic and Latin inscriptions, for in Latin they are labeled “SOL” and in Arabic “Dinar”. 4 See Cécile Morrisson and Michel Kampmann, “Le dernier solidus byzantine frappé à Carthage (695)”, Bulletin de la Société Française de Numismatique 34, no.5 (May I979), p.5l6 n° 8. Other modern historians propose conquest dates from 692 to 698. 5 The prototype is an issue of the Byzantine emperor Heraclius and his heir Heraclius Constantine, issued at Carthage about 610-13. see Walker p.54 no. (a). 6 The difference in weight was the result of gradual decline in the weight standard of the Carthage mint in the seventh century, seen in the examples in the collection of the American Numismatic Society and also described by Cécile Morrisson, J.N.Barrandon, and J.Poirier, “Nouvelles recherches sur l’histoire monétaire byzantine: évolution comparée de la monnaie d’or à Constantinople et dans les provinces d’Afrique et de Sicile", Jahrbuch der österreichischen Byzantinistik 33 (1983), 267-87. These apparently small differences represented substantial amounts of money for the people of the time. 7 The anomalous weight standard of Late Byzantine and Umayyad solidi/dinars of North Africa was first noted by Enrico Leuthold, Jr., “Due rare testimonianze della prima monetazione musulmane a Canthagine”, Rivista italiana di numismatica 69 (1967), 94-5. He estimated it at 4.28 grams, probably not a significant difference from my figure of 4.29. 8 All the coins have an inscription on the obverse and on the reverse, in both cases inscribed clockwise around the edge. 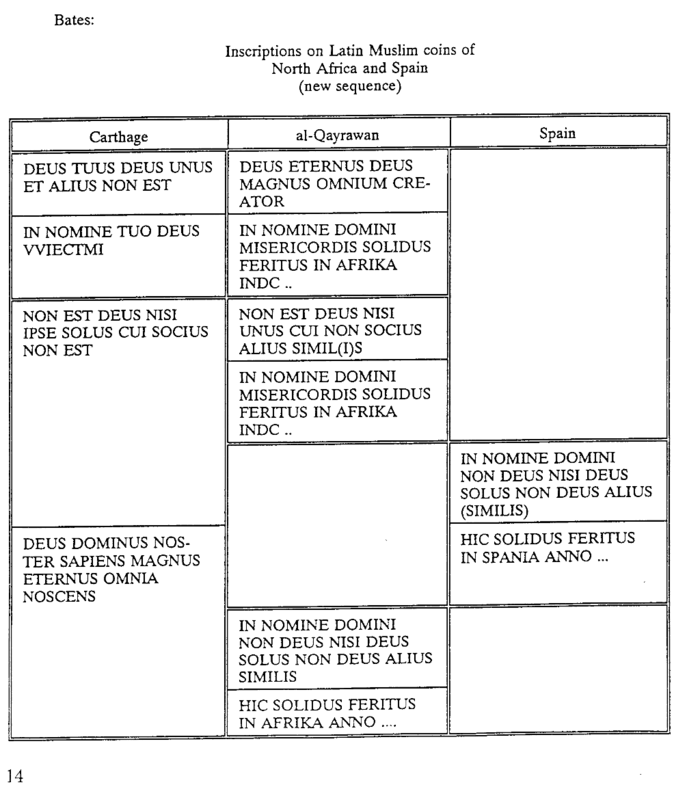 In the table, each box surrounded by double lines describes a single inscriptional variety. A single line within the box separates the obverse inscription (above) from the reverse inscription. The boxes are arranged vertically under each mint in chronological order. with the earliest at the top. Empty boxes indicate absence of minting. Boxes that are horizontally adjacent represent contemporaneous issues. For example, the second double box under Carthage, with inscriptions beginning NON EST DEUS and DEUS DOMINUS represents the second issue from that mint, spanning the period of two issues at al-Qayrawan with an interruption when no coins were minted. 9 For year I3, see Juan José Rodriguez Lorente and Tawfiq Ibn Hafiz Ibrahim, Numismatica de Ceuta Musulmana (Madrid. 1987), 171 no.201. The specimen they publish confirms a dubious publication of another in the early nineteenth century. 10 For a more extended discussion, see Michael L.Bates, “The Coinage of Spain Under the Umayyad Caliphs of the East, 711-750”, in: Actas III Jarique de Numismatica Hspano-arabe. Museo Arqueologica Nacional. Madrid 13-16 diciembre 1990 (Madrid, 1992), 271-89.